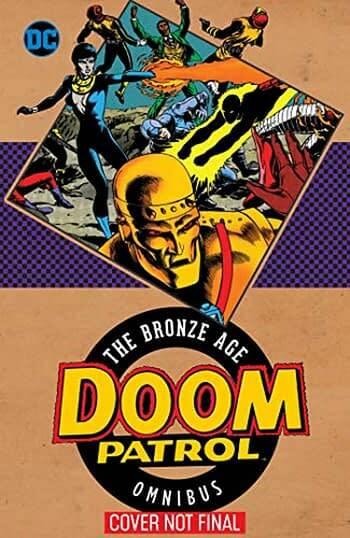 Paul Kupperberg has been spilling the beans on the contents of the upcoming Doom Patrol Bronze Age Omnibus out in September, reprinting some of the most ignored Doom Patrol stories published – that have never been reprinted since. But more than that – some of them were never published at all. Some of the rarest adventures of the Doom Patrol, the stars of their own live action TV series streaming on the DC Universe platform, are reprinted for the first time. Following the end of their original series in 1968, the Doom Patrol, the World’s Strangest Heroes, made their return in 1977 in a series of tales that jumped across titles and featured appearances by Supergirl, Superman, the Suicide Squad and more! This collects SHOWCASE #94-96, DC COMICS PRESENTS #52, DARING NEW ADVENTURES OF SUPERGIRL #7-9, SECRET ORIGINS ANNUAL #1, DOOM PATROL #1-18, DOOM PATROL AND SUICIDE SQUAD SPECIAL #1, SUPERMAN #20 , DOOM PATROL ANNUAL #1 and stories from SUPERMAN FAMILY #191-193, along with a new introduction by Paul Kupperberg. I’ve recently had occasion to dig through a few old file drawers and I’ve come up with some interesting “lost” items from my 30+ years in the funny book business. Most of the found items have been in the form of unpublished scripts, both my own and copies of the works of others. Among those I written but unpublished were several fill-in stories, including a mid-80s Green Lantern fill-in, and a couple from the early-90s for The Doom Patrol and, this one, for Hawkworld. It was to be pencilled by my pal Rick Stasi, but it never got that far (the DP fill-in was pencilled, by Rick; I’ll run that one of these days).